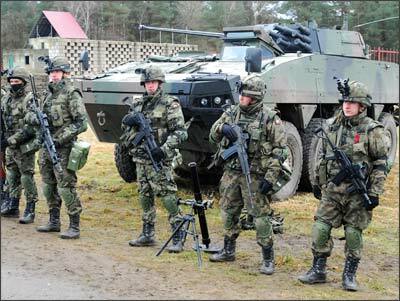 Poland’s soldier modernisation programme (SMP) has a long history. The first future soldier concept was created in the early 1990s at the Military University of Technology (WAT) in Warsaw. However, it was only in 2006 that the Polish Ministry of Defence (MON) formulated an Outline Staff Target (OST) and started a programme called the Personal Battle System (Indywidualny System Walki) or ISW Tytan. The name derives from Ancient Greek mythology, where Titans were a race of giant deities. In 2006, four Task Groups were also created. Their areas of responsibility were: integrated equipment, armament and sights, electronics, opto-electronics and software and personal protection (ballistic, mechanical, environmental and NBC). The Task Groups’ work, combined with the experience from Poland’s deployments to Iraq and Afghanistan from 2004, resulted in the creation of a pre-feasibility study (PS) as well as the establishment of staff requirements (SR). The aim of the ISW Tytan soldier modernisation programme was to create from scratch, a system of systems, with all new soldier weapons and equipment – an electronically-packed uniform and helmet, C4I system, computer and power source integrated within the vest. This objective was very ambitious and long-term, however in 2009 the Polish Land Forces Command officials realised that the OST from 2006 had become outdated and needed to be updated. The dissolution of the Task Groups in 2008 following the creation of the PS and SR was subsequently found to have been unwise because of a lack of cohesion, compatibility and personal continuity in the next phases of research and development (R&D). Moreover, Army planners were now, also considering an evolution in the organisation of mechanised platoons, designed specifically for expeditionary units. Instead of the platoon consisting of three wheeled or tracked infantry fighting vehicles (IFV) based sections, they wanted to introduce a platoon of four, smaller IFV-based sections, the last section being responsible for fire support and equipped with a 40mm grenade machine gun and 60mm mortar. This new order of battle will undergo a six-month testing phase, beginning in the second half of the 2009. 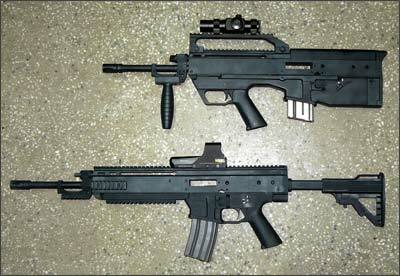 Last, but certainty not least, the Polish Army needs the new future soldier system as quickly as possible. In response, the concept of a minimal requirement ISW Tytan – so called Mini Tytan – was created. According to Brigade General Janusz Bronowicz, Chief of the Armoured and Mechanized Troops Department, Polish Land Forces Command (DWL), the Mini Tytan will be a basic version of the Polish future soldier system, consisting mainly of currently issued weapons such as the 5.56 mm wz. 96 Beryl assault rifle and wz. 96 Mini Beryl carbine, 7.62mm UKM-2000 machine gun and other equipment including the legacy ballistic/tactical vest, EOTech HWS.552 holographic sight, MU-3 night vision goggles and new battledress uniform which is field tested now. These in turn may also become the backbone of the future ISW Tytan. By combining these current elements of armaments and equipment, with GPS and a personal radio issued every soldier, General Bronowicz believes that the minimal requirement Tytan, designed for expeditionary forces, can be achieved straightforwardly. General Bronowicz said that the Mini Tytan (named version A) may be available in 2009 and could be issued to the sixth rotation of the Polish Military Contingent in Afghanistan (PKW Afghanistan) and – which is equally important – can be easily modified and upgraded, with new modules easily added either to replace older systems or in time, extend system capability. There are several research and developed projects in Poland which can be easily combined with ISW Tytan, for example a new rifle, the system MSBS-556, 5.56 mm assault rifle which consists of a common receiver in either a ‘Classic’ and bullpup design, new 8.6 mm (.338 for Lapua Magnum) sniper rifle, the Alex-338 as well as a semi-automatic sniper rifle in the same calibre or hybrid thermo-night vision goggles known as PCO Fusion. The standard variant of the Tytan (version B) will be designed for mechanised soldiers, and the most advanced variant (version C) will be designed for reconnaissance and special units as well as boarding teams. General Bronowicz added there are still many questions to discuss and evolve regarding Tytan, for example decisions on whether Tytan will be issued at company or platoon level. He added that Mini Tytan or Tytan itself will be a system developed primarily for expeditionary, not nationally based units, and that there were no situations during Polish deployments to Iraq or Afghanistan where an entire company was in action. General Bronowicz said that the Polish Land Forces Command fully understand the importance of the soldier modernisation programme to the Polish Army, and added that ISW Tytan is one of the Land Forces’ priority programmes in 2009, with funds having already being allocated. A definitive decision regarding the spiral system development of ISW Tytan and Mini Tytan has not yet been made, although Polish Land Forces Command has received an unofficial green light from the Polish Ministry of Defence. When the PS and RS for the ISW Tytan were completed, the Warsaw based company CNPEP Radwar, part of the Bumar Group signed a co-operation agreement with France’s Sagem who produce the FELIN SMP. Radwar wanted to interest the Polish Army in a system called Ulan-21 or Lancer-21, developed on the basis of Sagem’s expertise but with only limited participation by Polish companies. In the middle of 2008 they organised a presentation of the Ulan-21 on the military testing ground in Nowa Deba.